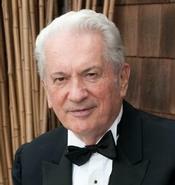 Stephan C. Gaspar, Architect, AIA, age 79. Passed away May 20, 2013 surrounded by his family. Beloved husband of Katalin “Kate”; dear father of Andrea and the late Adam (survived by Ann); grandfather of Nick, Monika, Juli, Gabi, Emily and Adam; brother of Nicholas, Gabriella Heil and the late Erika; brother-in-law of Steve Hegedeos. The family will receive friends 4-7 PM FRIDAY JUNE 7, 2013 AT BODNAR-MAHONEY FUNERAL HOME 3929 LORAIN AVE. CLEVELAND. MEMORIAL MASS 12 NOON SATURDAY JUNE 8 at St. Emeric Hungarian Church 1860 W. 22nd St. Cleveland (East end of Bridge Ave.) Inurnment June 10th at Ohio Western Reserve National Cemetery.